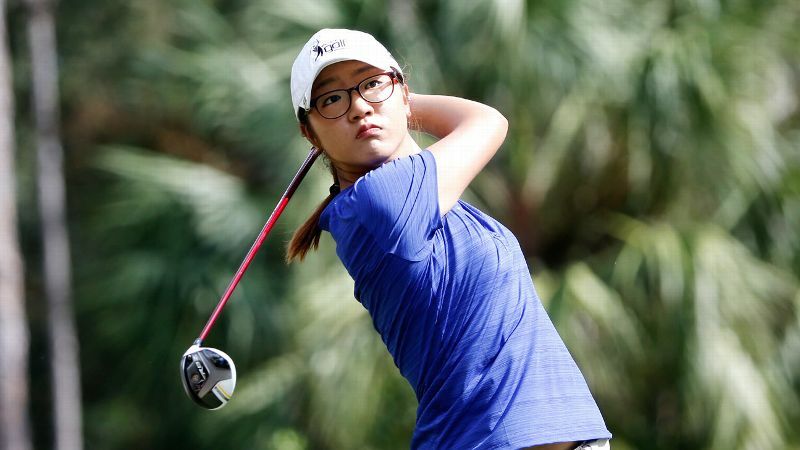 It remains to be seen if Lydia Ko can retain her calm, happy demeanor while playing as a professional and dealing with the business aspect of sports at the tender age of 16. For as long as she could from a practicality standpoint, Lydia Ko remained in the amateur golf world and kept everything as uncomplicated as possible. But when you already are one of the best in the world while still just a kid, you can't stay just a kid. Ko has had adult decisions to make in recent months. She has had her parents and some advisers to guide her. But in the end, the choices will be deemed hers. 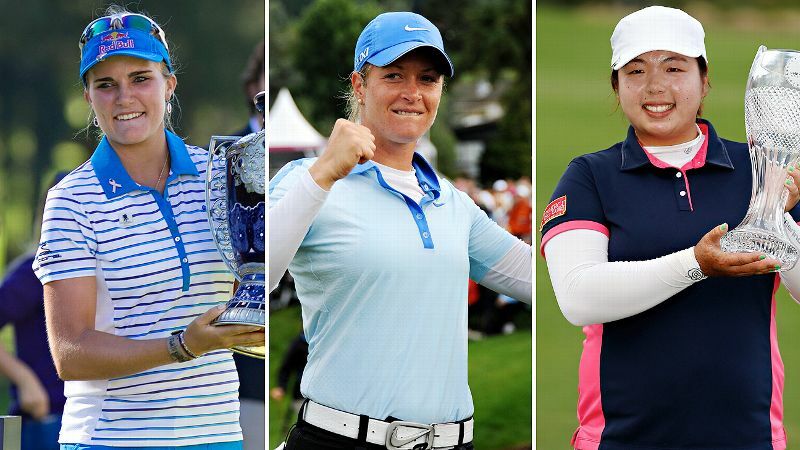 The LPGA bills itself as a global tour, featuring the best women golfers in the world. But as much as it showcases a diversity of nationality and cultures, there also is a wide range in age among tour players, including some teenagers who are talented beyond their years. This season in a Total Access series, espnW will focus on teens on tour. Throughout the course of the year, we’ll follow three of the game’s most promising stars: Lydia Ko, 16, and Lexi Thompson, 18, on the LPGA Tour and Ladies European Tour player Charley Hull, 17. Ko is currently ranked No. 4 and won two LPGA events while an amateur. Thompson, ranked No. 9, already has three LPGA titles in her career. Hull captured golf fans’ interest with her steely performance during Europe’s Solheim Cup victory and was rookie of the year on the European tour in 2013. Watch out for these teens in 2014. At age 16, she has picked IMG as her management agency, signed to play with Callaway Golf clubs, agreed to a sponsorship deal with a bank and -- this is the toughest one -- split with the man who had coached her since she was 5. Guy Wilson watched Ko grow up and definitely has to get a fair amount of credit for how she's ascended to No. 4 in the world rankings before even playing her first full season on the LPGA Tour. But Wilson is a casualty, if you will, of the whirlwind that Ko had to enter. He is too far away, back in Auckland, New Zealand, to be a regular fit in her new life. Ko instead will work with U.S.-based David Leadbetter and will be coached primarily by Sean Hogan of the Leadbetter Golf Academy. Ko was born in South Korea and raised in New Zealand, and now she must spend a significant amount of her time in the United States. She has had a lot to figure out since receiving the news in October that she hoped for from LPGA commissioner Mike Whan. Welcome to the business side of sports; it's nearly inevitable that at some point in an athlete's career, there will be hard choices and hurt feelings. For a teenager whose mother says her daughter's defining personality trait is a natural inner tranquility, this is a little disconcerting. Winner of two LPGA tournaments already -- but unable to collect any prize money because of her amateur status -- Ko knew last fall she had to make a dollars-and-sense move to pro status. She petitioned for early membership to the LPGA Tour. Whan, recognizing her maturity and results at 16, granted it. Ko played her first event as a professional at the CME Group Titleholders in November in Naples, Fla., tying for 21st. She then won a non-LPGA pro event in Taiwan. She'll start her 2014 LPGA rookie season, along with the rest of the tour, in the Pure Silk Bahamas LPGA Classic this week. Being a professional and being an amateur is totally different, and I'll have to learn a lot. "Being a professional and being an amateur is totally different, and I'll have to learn a lot," Ko said. "I need to play three or four weeks in a row and only a one-week break. Obviously, I need to perform well, but it's more about learning and getting more experience." Ko already has heard some criticism from back home in New Zealand about parting with Wilson, who said in a statement to the media that he was "incredibly disappointed" but respected her decision. Ko said she was sad about it and still considers Wilson a good friend. If that sounds naive, it probably is. But it's also, no doubt, sincere. Ko enjoys playing golf, and she's been superbly good at it thus far. However, aspects of being a pro are not so easy to deal with. Telling the only person who's ever coached you that now, just as you're set to start cashing in, he's being replaced? That's a lot harder than anything Ko has had to learn about the game. To make tough decisions such as that before your 17th birthday -- that's in April for Ko -- is to be thrust into a realm where even experienced adults can struggle. "I'm actually very thankful that I wasn't good enough at the time to even think about going pro as a teenager," U.S. veteran Angela Stanford said. "It can be lonely on tour sometimes. When your career is over, hopefully you have something more to hang your hat on than just your time out here." Ko is about to begin her "time out here" in earnest. There's no going back to any of the simplicity of her amateur days. Well, hold on a second. Were her amateur days all that simple? Her parents moved to New Zealand when Ko was 5. Ko's mother, Tina Hyon, said she wanted different scenery for herself, her husband, Hong Ko, and their two daughters. "I had lived in Seoul for more than 10 years," Hyon said. "I didn't like it - too polluted, too crowded, too many cars, the noise. I loved to be out of it; I wanted some change." There was a large Korean community in New Zealand, on Auckland's North Shore, and that's where the family relocated. Soon, Hyon took little Lydia to a golf lesson with a local pro, Wilson. Lydia knew almost no English yet, which was another thing besides golf that she'd work on with Wilson. Her skill, though, was almost immediately evident. "It was not that common to see a 5-year-old hit the ball that way," Hyon said. Indeed, Ko has some natural gifts -- including her placid demeanor -- that meshed perfectly with golf. Had she stayed in South Korea, she would have been one of the latest generation of the so-called "Se Ri Kids," the moniker given to Korean female players following in the footsteps of Hall of Famer Se Ri Pak. Instead, Ko became a much bigger fish in a smaller golf pond in New Zealand. Wilson encouraged Ko's parents to get her citizenship so it would be easier to receive financial help through New Zealand's national golf association. It was a mutually beneficial relationship, as Ko got funds to travel and pursue her amateur career, and New Zealand got the publicity of having such an accomplished youngster making global headlines. In 2012, her breakthrough victories began. In January of that year, Ko won her first pro tournament at age 14 on the Australian women's tour. 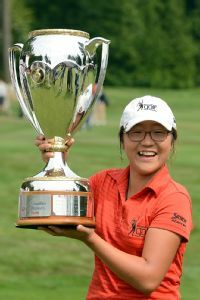 After turning 15, she won the U.S. Women's Amateur, and then, in the real stunner, won a full-fledged LPGA title -- the CN Canadian Women's Open. 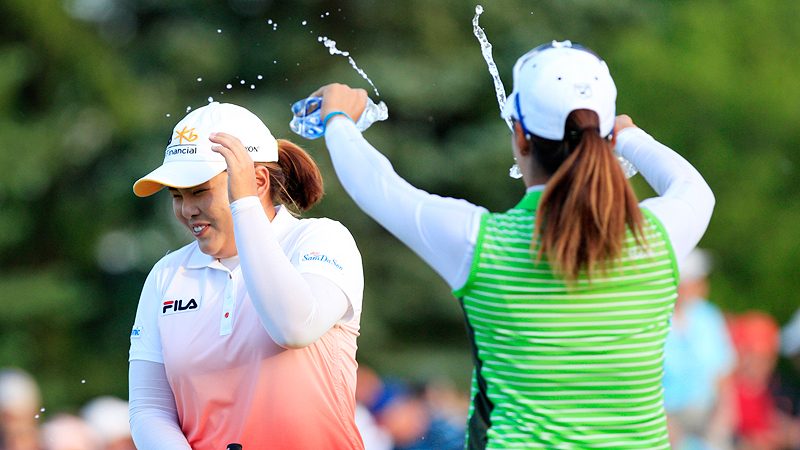 With that, Ko became the youngest to win an LPGA tournament and just the fifth amateur to do so. As a 15-year-old in 2012, Lydia Ko won the Canadian Open and became the youngest winner of an LPGA event. IMG representative Mike Scanlan was then a media-relations director on the LPGA Tour. He recalls Ko's news conference after that 2012 victory in Vancouver being more than a little surreal. "I was blown away by how she commanded the room,'' Scanlan said. "She didn't know the media there. I was moderating the press conference, and she didn't know me. Outside of her mom in the back of the room, she had no lifeline. But she proceeded to just charm everybody with the demeanor that we've all now seen: very laid-back, very thoughtful. "I think the most impressive thing was the perspective that she had as a 15-year-old who had just won a pro golf tournament. She already had a long-term vision that this probably wouldn't be the highest point in her career. She just took it in stride. Now, with the opportunity to work with her on a daily basis with her management company, I feel very lucky to have had that experience of seeing her first sort of 'Hello, world' moment." Being a teen phenom in professional sports certainly isn't new ground. Lexi Thompson, for instance, won her first LPGA event at age 16. Fellow American Michelle Wie didn't win a pro tournament that early, but she was playing in big-time events by age 13. Wie, in fact, was Ko's idol. But Ko's results thus far have been more significant and consistent. It's that latter part, Ko's consistency, that especially impresses older players on tour. Same for Ko's personality. It's a tricky tightrope to walk for a youngster trying to socially fit into an environment that is highly competitive yet also has at least the veneer of genial courtesy between the players. Veterans may be annoyed by the youthful success and find reasons to criticize "kid" players, especially for deportment or perceived breaches in golf etiquette. That happened to Wie, among others. A young player needs to be conversational during a round, but not too much so. She needs to be deferential in some ways, without giving away anything as a competitor. Ko has done all of this just as well as she's done the actual golf part. 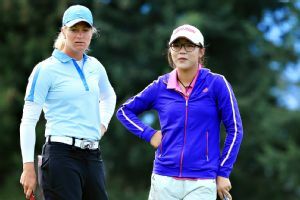 Young players walk a fine line playing with LPGA veterans, trying to socially fit into a highly competitive environment. "I just think [teen players] are all different. Some kids are really curious and friendly, some just want to play golf. Some have a lot of people around them, and it's hard to get to know them." Ko mostly has had just her mother around to this point. Her father does not speak English and is not as comfortable traveling away from his comfort zone in New Zealand. Ko's sister, Sura, is 24 and works for an airline in New Zealand. Despite their eight-year age gap, Hyon said her daughters are "very close -- Lydia calls her 'my angel.'" Guiding Ko's career has become her parents' occupation. Ko's mother was previously a teacher, and her father ran a business. 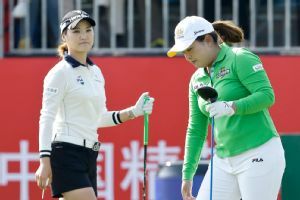 Hyon chuckled, somewhat nervously, as she frankly explained how her husband got so wrapped up in his daughter's golfing ability that he lost interest in his business. "The business didn't go well because he focused on Lydia," Hyon said. "He didn't care; he only liked to be with her. He really loves Lydia as his youngest. She's the youngest one in all our family. Everybody loves her, actually." When they are back in New Zealand, Ko's father is into her golf game "from morning until darkness," according to Hyon. "When Lydia goes to practice, my husband goes with her. I want to be at home having a rest." Will Ko's father move to the United States now? "I'm not sure," Hyon said. There are still a lot of things for the family to work out. Some of it, no doubt, will have to be by trial and error. But now that Ko has IMG looking after her affairs, two IMG managers will share the point position for her. One is fluent in Korean, which is an important factor, especially in regard to Ko's father. Ko has said she isn't worried about the negative effects of a coaching change. She said playing for money is not going to dramatically alter her outlook. She already has had a taste of being in the spotlight and hearing plenty of opinions about herself and her game. "Sometimes people say, 'What's wrong with your putting and so on?'" Ko said of the unsolicited critiques that are offered. "Actually, I was putting at home, and this little boy said, 'You're not putting good these days.' And I thought, 'Oh, that's sad.'" Lydia Ko knocked on the door at the Evian Championship but finished runner-up to Suzann Pettersen. Suffice to say, though, Ko does not need to get motivation from a pint-size, self-proclaimed putting expert. She pushes herself hard enough. Ko played in 12 LPGA events last year, making the cut in them all. She repeated as Canadian Open champion in August and had five other top-10s. That included a runner-up finish to Suzann Pettersen at the Evian Championship, which was elevated to a major last year. "Apart from Evian, [at] all the other majors I felt like I could have done much better," she said of finishes that ranged from a tie for 17th at the LPGA Championship to a tie for 42nd at the Women's British Open. "[With] a lot of the tournaments in warm, hot conditions, I've just got to not overdo practice, especially that week, and kind of pace myself." That could be an overriding theme for everything Ko does this year: pace herself. Scanlan said that as much as IMG looks forward to promoting Ko as a global golf figure, the agency will take care not to overtax her time. She may not be able to fulfill every media or sponsor request, but she'll do all she can. Once you're on this merry-go-round, there isn't much chance to step off. For a youngster who loves photography, wishes she could have a dog, and is still starstruck by golf luminaries such as Phil Mickelson, there is clearly much more good than bad resulting from this gift she has. "I wish I could live like Lydia, just for one day," her mother said, "because she always looks happy. She was born to be like this. At my age, when you get old, you sometimes get upset easily. But she does not have that personality." For all that will be different for Ko as her pro career is beginning, let's hope that who she is, deep down, is not one of the things that must change.